The premise of Marvel’s original Runaways comic series has so many moving parts that the idea of distilling it all down into an hour-long television pilot boggles the mind, and yet that exactly what Hulu’s live-action adaptation manages to do. Even by comic book standards, Runaways’ cast of core characters is a big one. 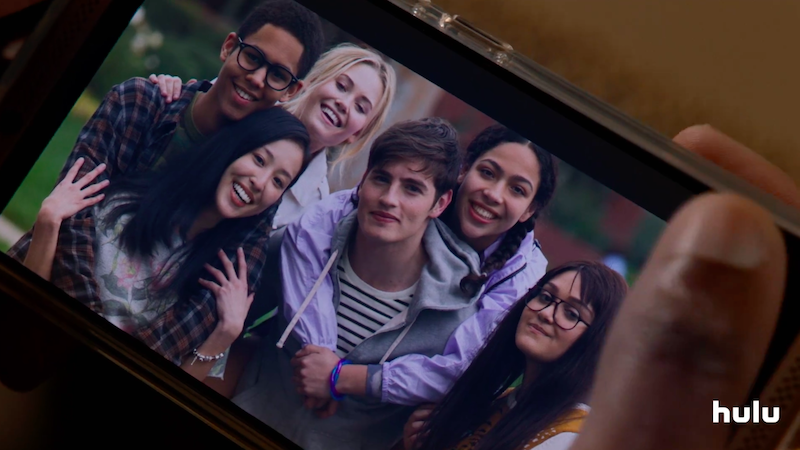 There are the Runaways themselves—Alex (Rhenzy Feliz), Nico (Lyrica Okano), Gert (Ariela Barer), Karolina (Virginia Gardner), Molly (Allegra Acosta), and Chase (Gregg Sulkin)—and their parents, a group of rich and powerful professionals from various industries who are all secretly part of a murder cult. It helps that as the show opens, everyone already has history with one another. Though they all work in different fields, the kids’ parents are all longtime members of The Pride, a supposed community outreach program that focuses on helping troubled youth. Years of regular Pride gatherings meant that the kids grew up together and were at one point a close-knit group of friends. But the death of Nico’s sister Amy (something that happens before the show begins) breaks them apart at a time when all childhood friendship are strained as kids make the transition into their teen years. Alex, a soft-spoken gamer, has been withdrawn from his friends and the rest of the world since Amy’s death and his parents, two high-powered lawyers, don’t really know how to reconnect with their son. Nico herself wears a relatively newfound goth identity as armor that keeps those around her at a distance and the others Runaways all throw themselves into the kinds of extracurricular activities that consume high schoolers’ lives. In their own ways, each of the Runaways projects a veneer of different kinds of perfection that you can see beginning to crack over the course of the first episode. Chase dutifully straddles the gap between all-American jock and teen prodigy, but none of it is enough to win the approval of his emotionally distant and at times cruel father played by a fantastically menacing James Masters. Karolina, the most seemingly positive of the group, projects an aura of optimism that her peers mock not just because it reads as false, but also because her mother leads the Church of Gibborim, a Scientology-esque new age organization that secretly has ties to The Pride. Karolina’s earnest naiveté is sharply contrasted by Gert’s self-assured nihilistic perspective on life that she makes a point of sharing with anyone willing to listen. Molly, the youngest of the group, is the least jaded but she’s also the only member of the group with a secret of her own to hide. Unlike most of Marvel’s other television and streaming shows, that lead with the gritty realities of the MCU’s east coast, Runaways gives its characters the sunny backdrop of Los Angeles to throw all of their internal struggles into sharp relief. Everything about the world these kids live in is charmed and shimmering on the surface, but there’s both a hollowness at its core and a darkness that looms around its periphery. When Karolina works up the courage to defy her mother for the first time in her life and sneak away to party, she ends up trying an unknown drug and pulling off her Gibborim bracelet in an act of defiance. But after she briefly manifests her alien abilities for the first time, something she mistakes for a hallucinogenic trip, she passes out and is almost date raped by two of Chase’s friends who happen to be at the party. The moment is brief and Karolina escapes unscathed, but it’s a reminder that the problems the kids are dealing with aren’t limited to their evil parents. For all of its angsty teen melancholy, Runaways is surprisingly funny when it needs to be, and its cast has astonishingly great chemistry with one another from scene to scene. There are nascent romantic tensions between Alex/Nico and Chase/Gert, but by the time the group finally comes together in the pilot’s second half, they feel very much like a chosen family in the making. Similarly, the scenes focusing on the adults perfectly capture the different ways that familial relationships become complicated and strained as kids begin to see their parents as people as opposed to just Mom and Dad. The best and most intriguing thing about Runaways is that by the first episode’s close, it’s not quite clear what kind of teen drama it wants to be or whether it will ultimately end up hewing to one specific take on the genre. For many other shows, that might be a cause for concern, but it feels as if it might ultimately be what makes Runaways strong. Runaways begins streaming on Hulu November 21.